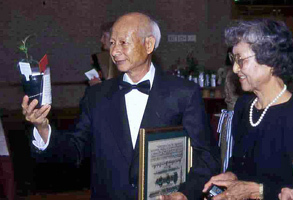 Born August 28, 1929, Ying Doon Moy grew up in a village near Hong Kong. 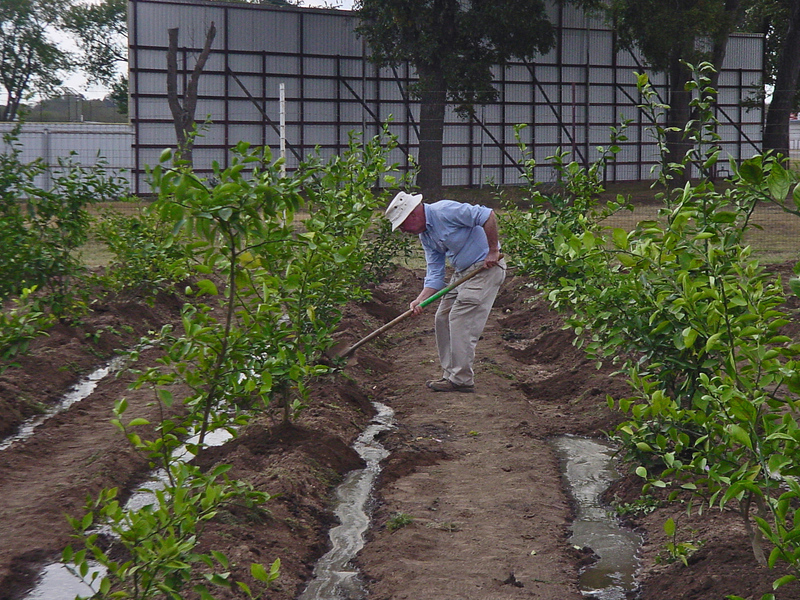 He was inspired to pursue a career in horticulture at age 11. “There was a beautiful flower market in Kowloon and I loved to go there,” he said. “I was impressed by the flowers’ beauty, size, color and smell.” He did his undergraduate and graduate studies in Canton at the Agricultural University of South China. 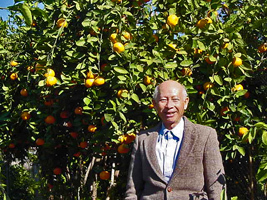 Obtaining a doctorate, he was named Associate Professor in charge of genetic research on citrus and vegetables. 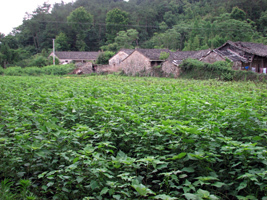 He was especially successful in developing seedless watermelons, improved sweetness of pineapples, and litchi. 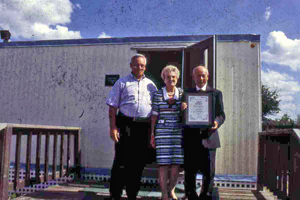 Mr. Moy endured many hardships during his life. He would sometimes have flashbacks to World War II where he would suddenly start talking about “bombs fell like carrots” and the Japanese soldiers would shoot into the crowd indiscriminately. Also, he was separated from his family who had fled to Hong Kong in the late 1950’s. Unable to return Hong Kong due to travel lockdowns, he was unable to see his family including his oldest son, until Mr. Moy arrived in the US in 1978. 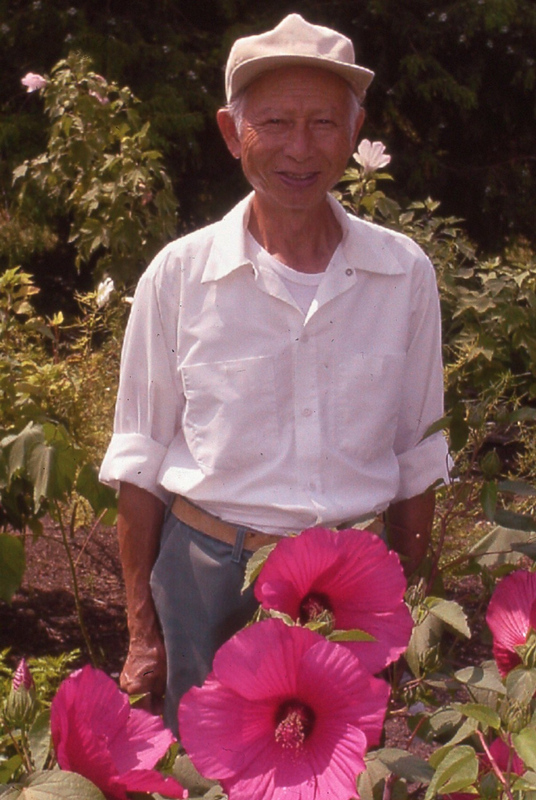 During the Cultural Revolution (1966-1976) in China he was stripped of his title and was forced into a program of hard labor and persecution to the extent that he and his family hid in caves and survived on weeds for an extended time. That is where he developed a dislike for purslane. Livestock were turned loose in his test planting areas where they destroyed his three prized bi-generic crosses. 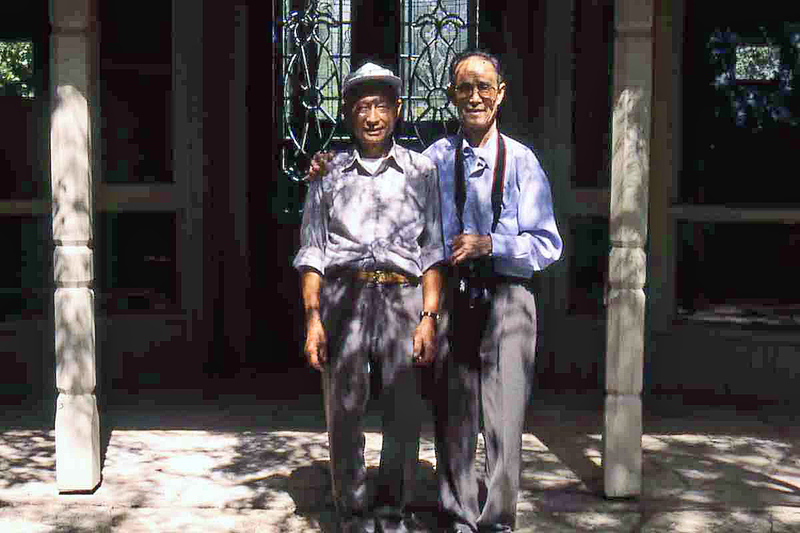 When President Richard Nixon visited China in 1973 to open up trade, Mr. Moy realized there was another life for him - in the United States. With the aid of the U.S., family and friends, he fled China with his wife and second son. He first went to Chicago to stay with relatives, but the cold climate was unsuited to his research. Soon he joined his brother-in-law in San Antonio where the climate is similar to Canton's. 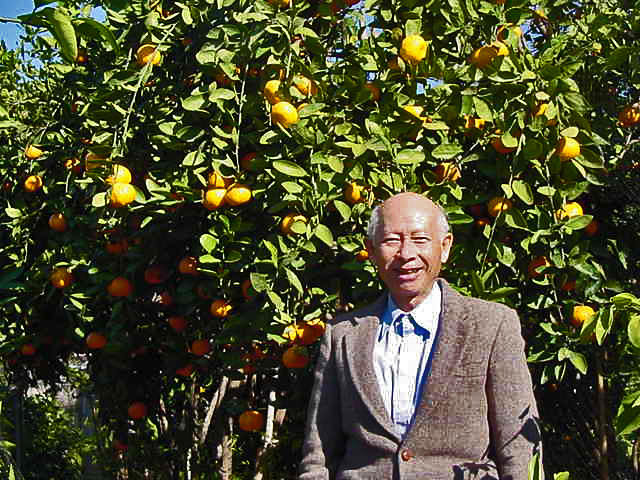 In San Antonio, Mr. Moy - he preferred to be called "Mr." rather than "Dr." - first came to the San Antonio Botanical Garden in 1980. As Paul Cox relates the story, the immaculately dressed, distinguished-looking Mr. Moy actually interviewed for the position of City Agronomist. 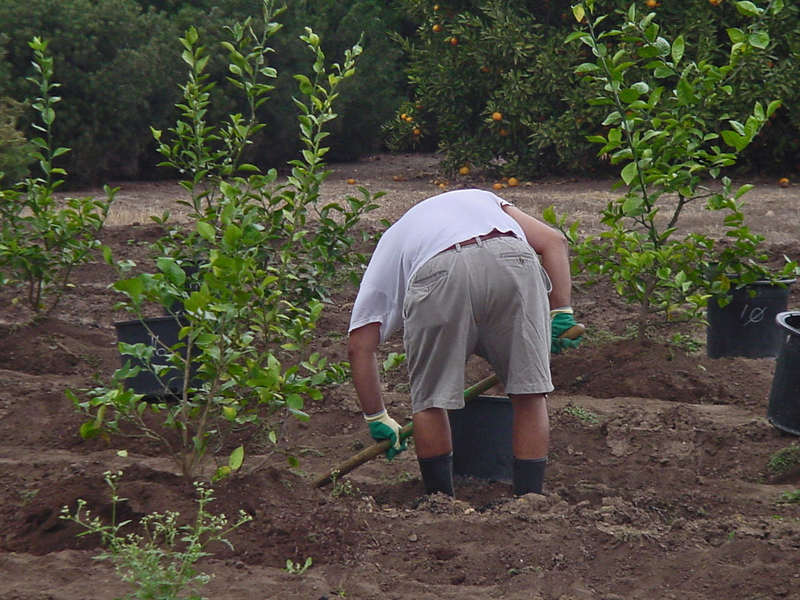 What he really wanted, though, was to work at the new Botanical Garden, even if the only position open was as a gardener. After a brief tenure at the City Nursery in Brackenridge Park, Mr. Moy got his wish to come to the Botanical Garden. 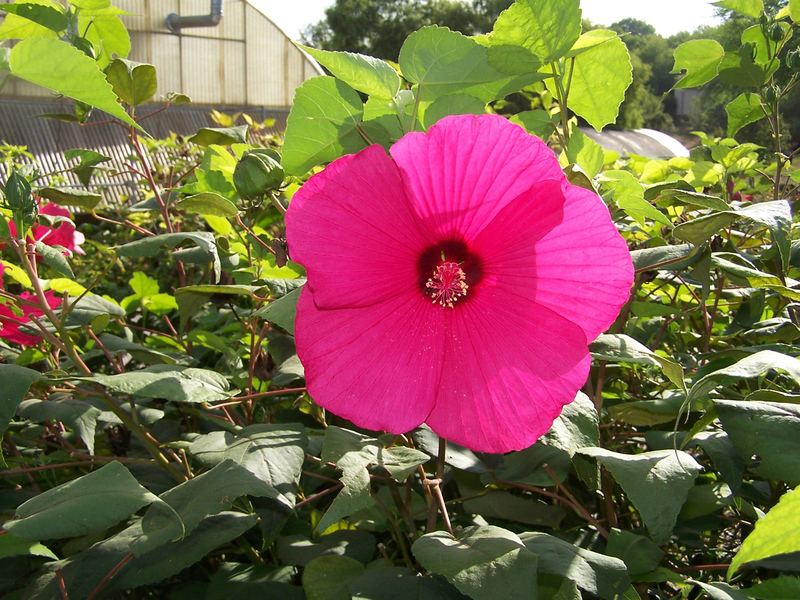 He received the same plants as the other gardeners, but his material always looked much healthier. Mr. Moy's explanation was that he talked to his plants, not in literal conversation, but simply by using his experienced eye to discern the plants' cultural needs. Papaya hybrids: Aromatic, Delicious, and Dulce; Ginger hybrids: Giant, Noble, and Robusta; Tecoma hybrids: Floribunda, Sunrise, and Sunset; Rose hybrids: Dwarf Beauty, Palace Pink, Red Lotus, and Shiny Wax; Chinese Hibiscus hybrids: over 57 varieties. 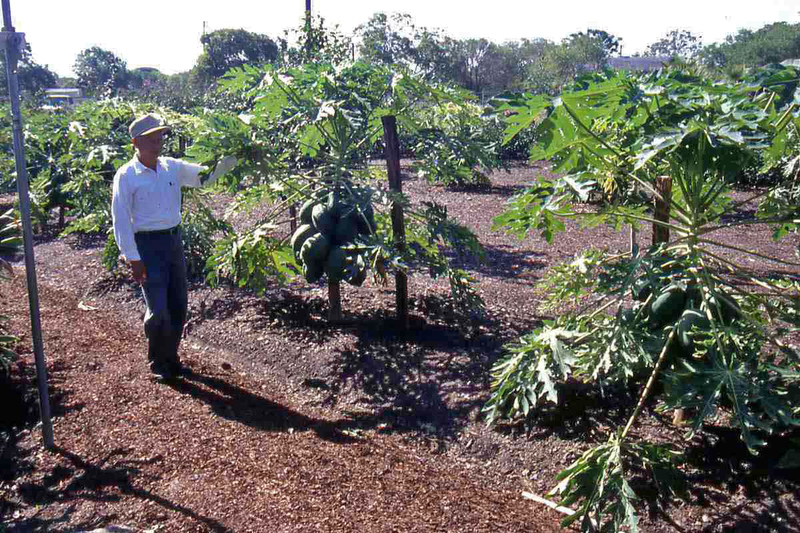 In the old days at the San Antonio Botanical Garden, we used to grow papayas for their bold tropical effect. They were nothing special, just some fruits we purchased at EI Mercado. 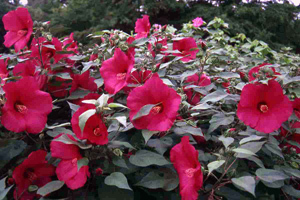 Mainly they were planted around the Formal Gardens or used as accents in the color beds. 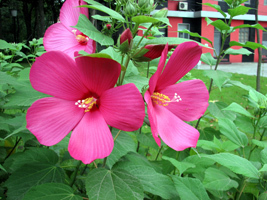 At that time Mr. Moy was the horticulturist in charge of this area. 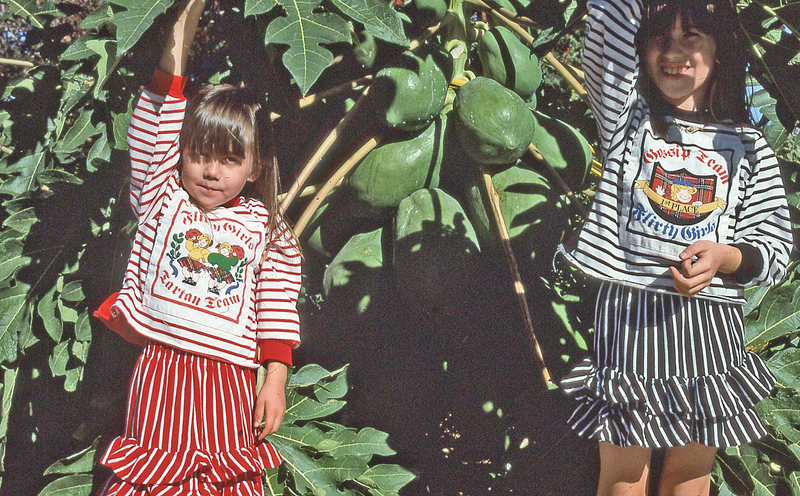 After a few years, we began to notice some changes in the papayas. 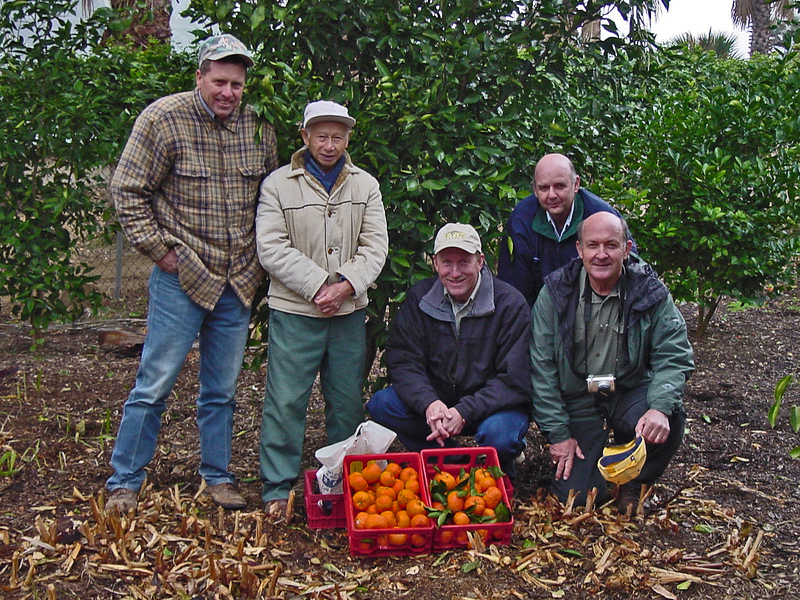 The plants were getting shorter and regularly maturing fruits in one season. Moy finally came forward and said he had been crossing and selecting certain specimens based mostly on sizes. 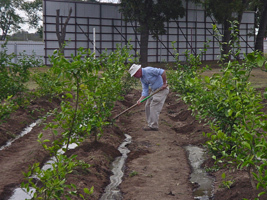 His first goal was to produce large fruited, early maturing varieties. This was very successful as he was turning out 25-pound fruits that were ready around the end of September. Visitors were amazed to see these huge fruits on these exotic plants. 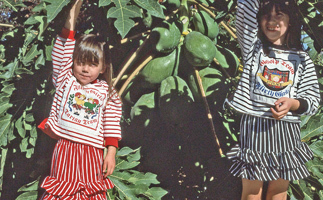 I would tell them they were "Watermelon trees" or 'Texas Figs." 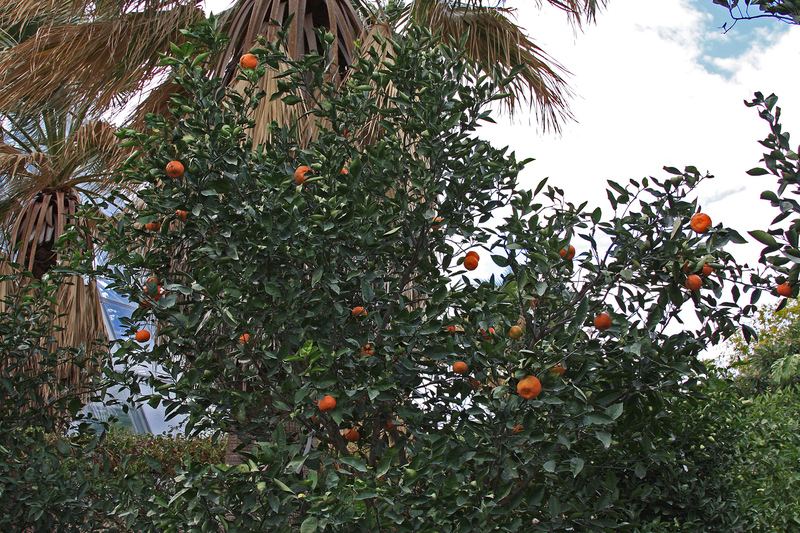 Impressive as these plants were, the fruits were relatively tasteless. 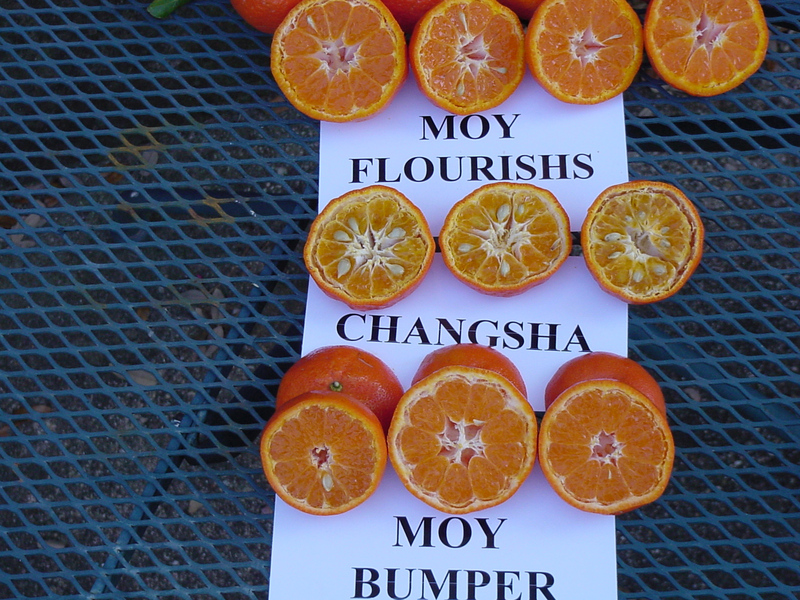 To improve the fruit, Moy began crossing the popular Hawaiian strain into his line. The problem with this was that the only way he could test the flavor of his plants was to get us to eat them. 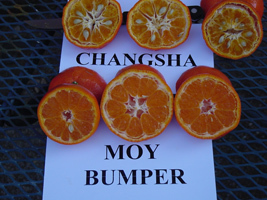 Aware of the impressive yield of up to 235 pounds of fruit per plant in one season, staff began to run away when they saw Moy approaching with papayas in hand. To solve this situation, we obtained a sugar refractometer from Dr. Jerry Parsons of the Texas Agricultural Extension Service. 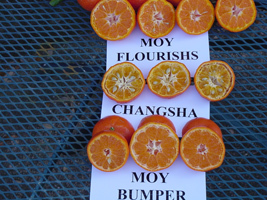 This enabled Moy to scientifically quantify the sugar content of his fruits. 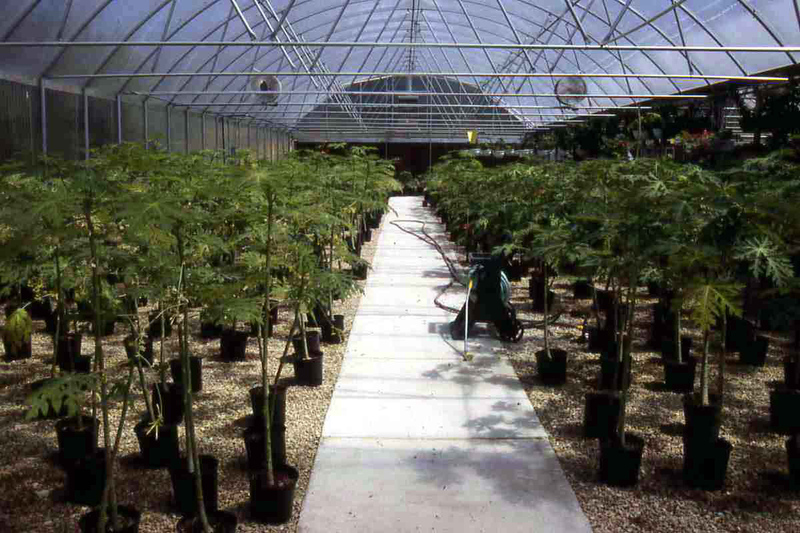 In time the papayas became our signature plant. 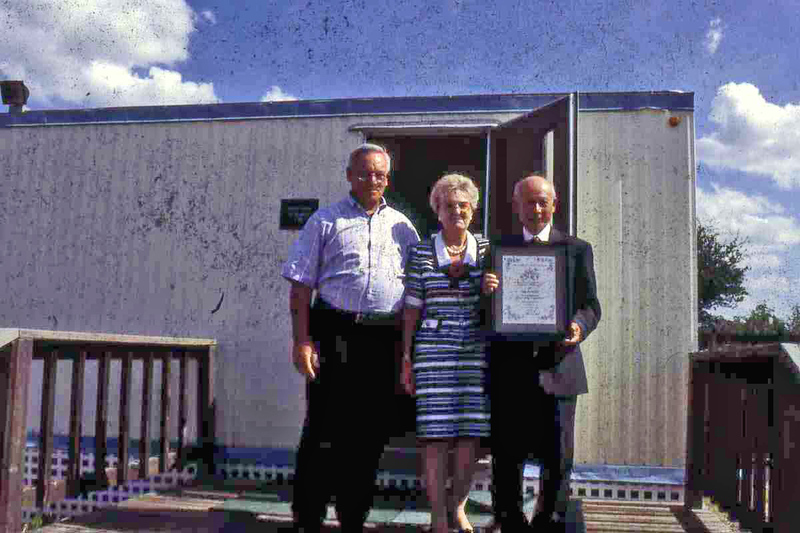 We featured them throughout the formal areas, and they received much acclaim. It was the papayas that gained Moy the recognition which won him his first awards. 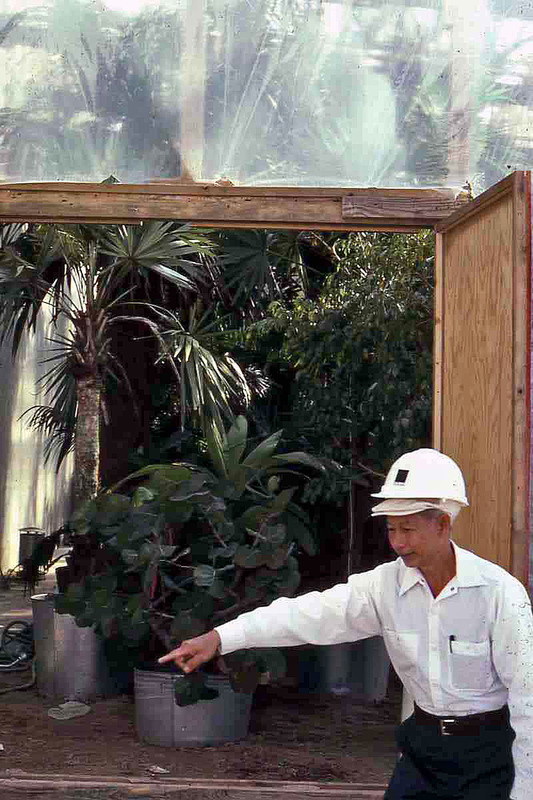 However, when the papayas were deemed inappropriate and banished from the Formal Garden, a new era began for Mr. Moy. 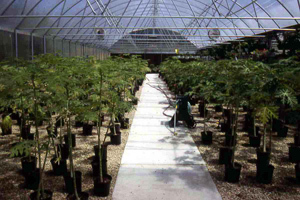 The tropical plants were relocated to an obscure portion of the facility (known to the staff as "Moyland") and Moy was relieved of his command. Freed from his former responsibilities, however, Mr. Moy could now actively pursue his hybridization program. 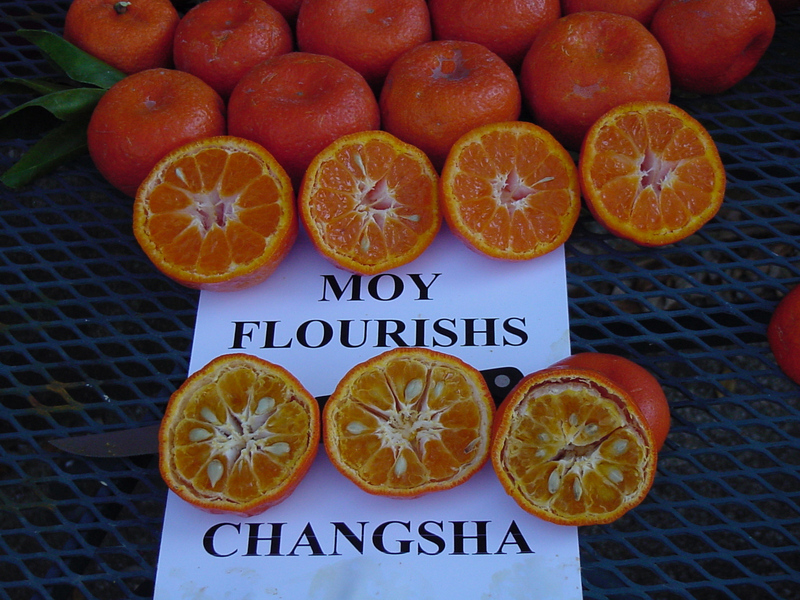 Public pressure eventually brought the papaya back to visibility, but Moy was on to other things. One day he told me he was in his sixties and having trouble seeing the small flower parts necessary for crossing. My brother, Robert, a jeweler, was able to provide some head- mounted magnifiers. 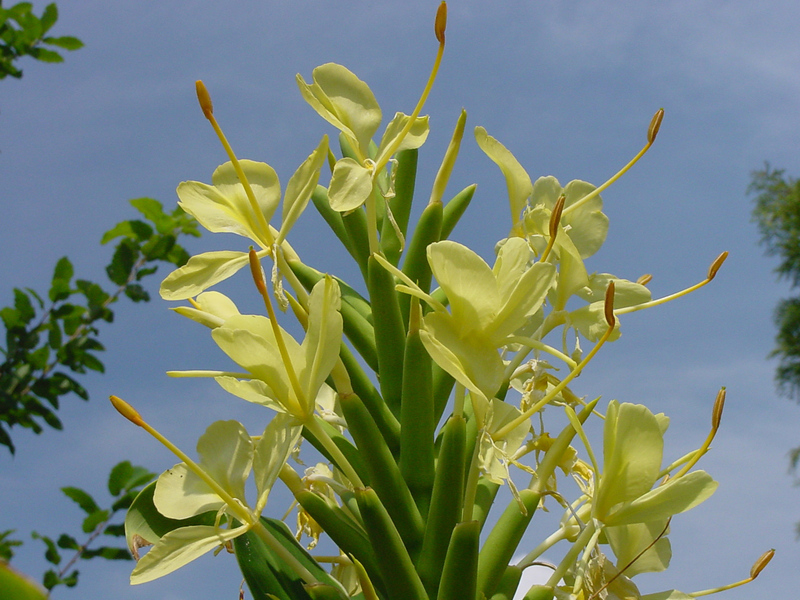 This little bit of technology gave rise to a veritable explosion of plant hybridization. 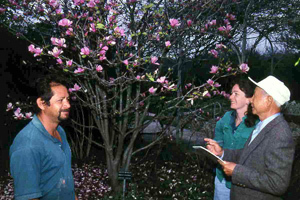 During my seven years as director of the San Antonio Botanical Garden, I had the great opportunity of being associated with Mr. Moy. 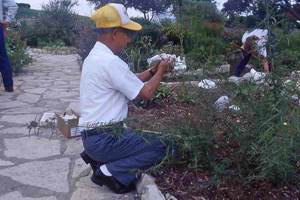 When I arrived at the Garden, I was amazed to find someone with Mr. Moy's talents working as a gardener. I found out that he was willing to make a sacrifice for his profession. 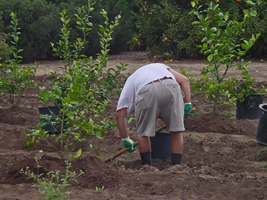 He would rather work as a gardener than take a better paying job in another field. I soon learned of this greater sacrifice, leaving his homeland, his career, and his research during the expulsion in China. Mr. Moy was a world-class horticulturist the day he walked onto the San Antonio Botanical Garden. He had trained most of the world's breeders of the tropical fruit and nut named litchi and a variety had been named in his honor, but he made no mention of this until he had been in San Antonio for several years. 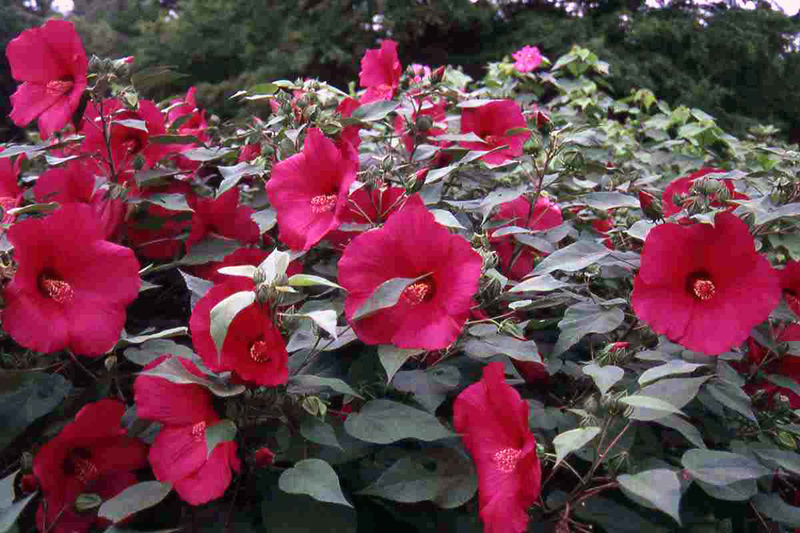 However, he could not conceal his aptitude for growing plants and his interest in plant improvement. 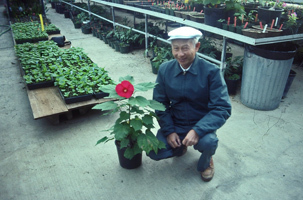 Although he was difficult to understand at times because of his Chinese accent, local horticulturists had no problem conveying to him the needs for plant improvement to increase marketability and survivability in arid Southwest Texas. Mr. Moy immediately began a breeding program to produce an early ripening papaya, but his project to produce a perennial hibiscus flower big enough to satisfy the Texas brag is the one that has brought his research and development program at the San Antonio Botanical Garden worldwide fame. 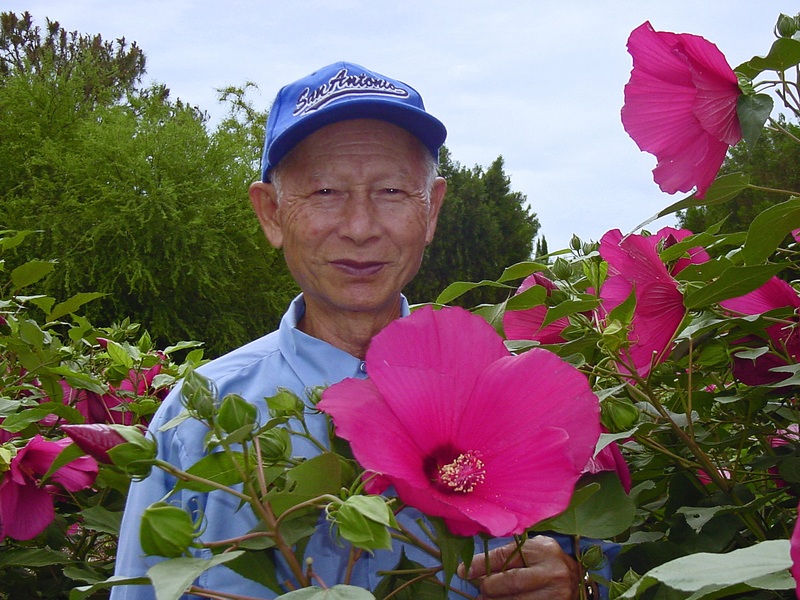 Mr. Moy cross-bred a Hibiscus moscheutos hybrid with Hibiscus grandiflorus to create the largest, open-face hibiscus flower in the world - the second largest flower IN THE WORLD. 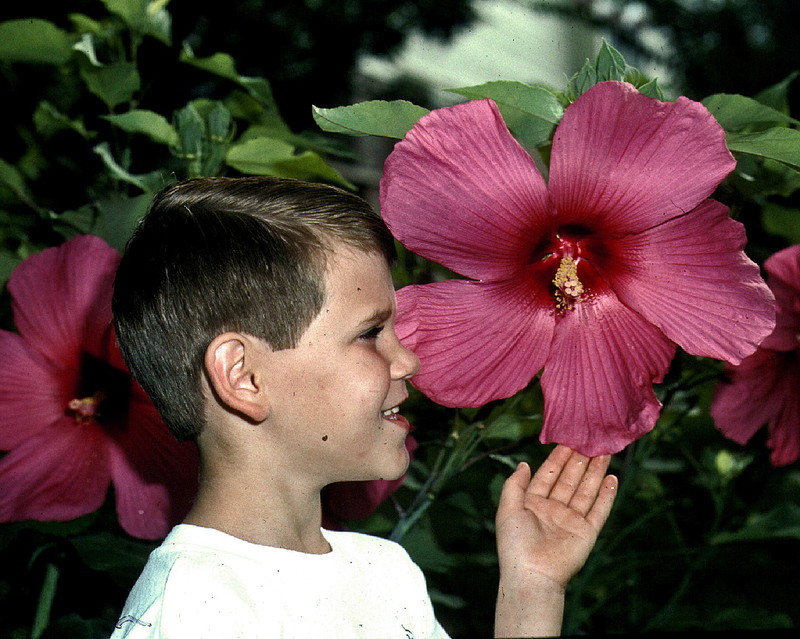 The phenomenon of hybrid vigor (the offspring is superior to either parent) resulted in huge, rose-pink flowers of the variety named in honor of its creator, ‘Moy Grande’ (Be careful not to say the name too fast or would be bilingual, politically correct experts may want to correct your pronunciation to the Hispanic version Muy Grande which means "very large". Obviously, these folks are just bilingual (English and Spanish) and not trilingual (English, Spanish AND Chinese!)). 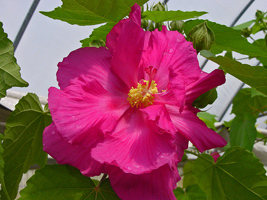 Hibiscus moscheutos 'Southern Belle', which usually has 8 inch diameter blooms, was cross bred with Hibiscus grandiflorus, which usually has 10 inch blooms, to create Moy Grande which has 12-inch blooms. 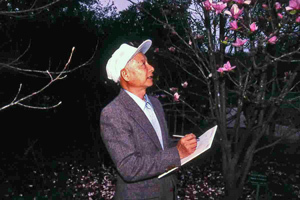 Professor Moy was the San Antonio Botanical Garden's greatest professional credential. He was a distinguished plant geneticist by whom many tropical species have been discovered and named. As you may know, San Antonio's climate is kindly described as "subtropical," meaning hot and thorny with poor soil. 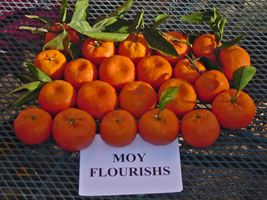 Dr. Moy, under difficult natural conditions, has made our gardens into a showplace. 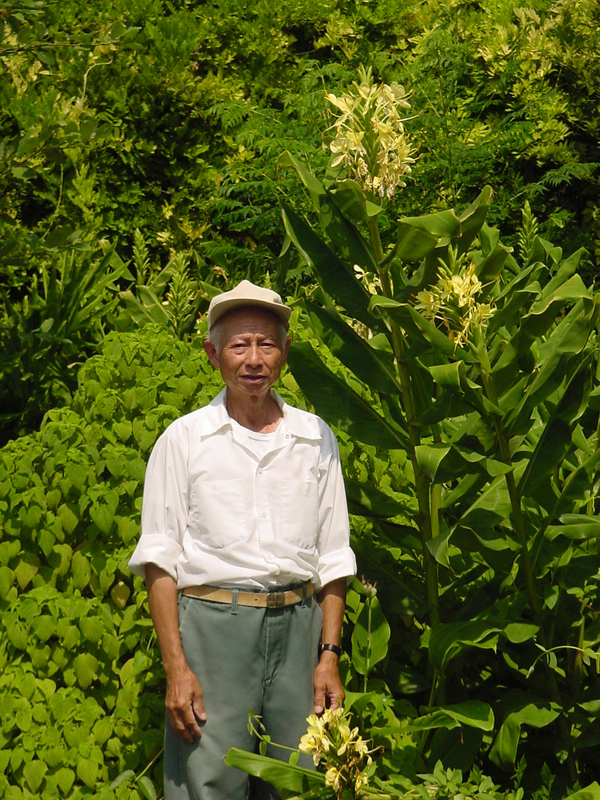 Ying Doon Moy was a mild, cheerful, unassuming man with a perpetual smile on his lips. He walked among his horticultural masterpieces with the firm steps of a benevolent creator, ever pinching off an errant bud, arranging the compost around the trunk so that it looks just so, talking to his plants as if they could (and probably did) understand his love for nature and their beauty. 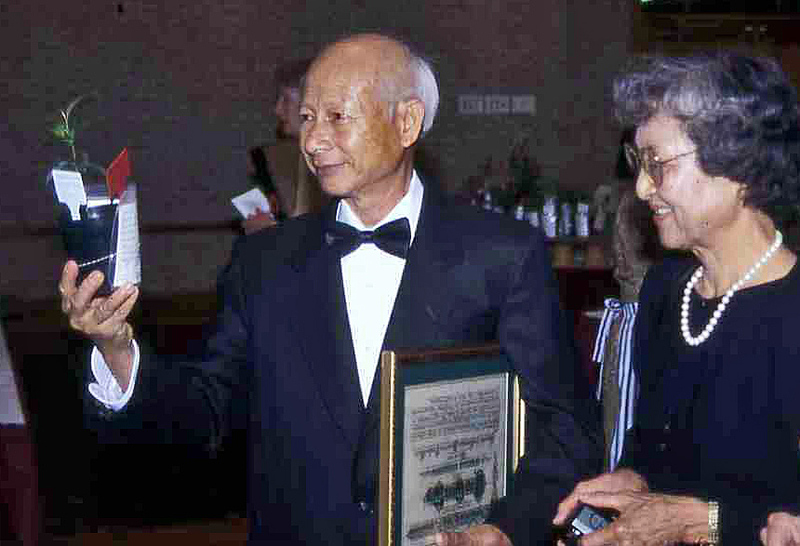 Mr. Moy acted as nature's marriage broker. He could look into the secret potential of even the most ordinary of plants, and by skillfully manipulating its genes know precisely where to find a proper mate. From his small, strong hands came great beauty. 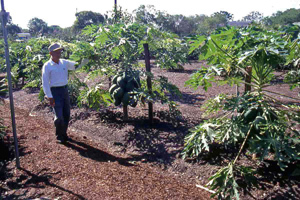 Who hasn't seen his papayas producing their bountiful crop in this inhospitable climate? Who hasn't admired one of the dozens of tropical hibiscus he created with names as exotic as Tiger, Sunshine and Shadow, Chrysanthemum Leaf, Marjie, and Lion King? Who hasn't felt terribly romantic after smelling the heady perfume of his three varieties of ginger? 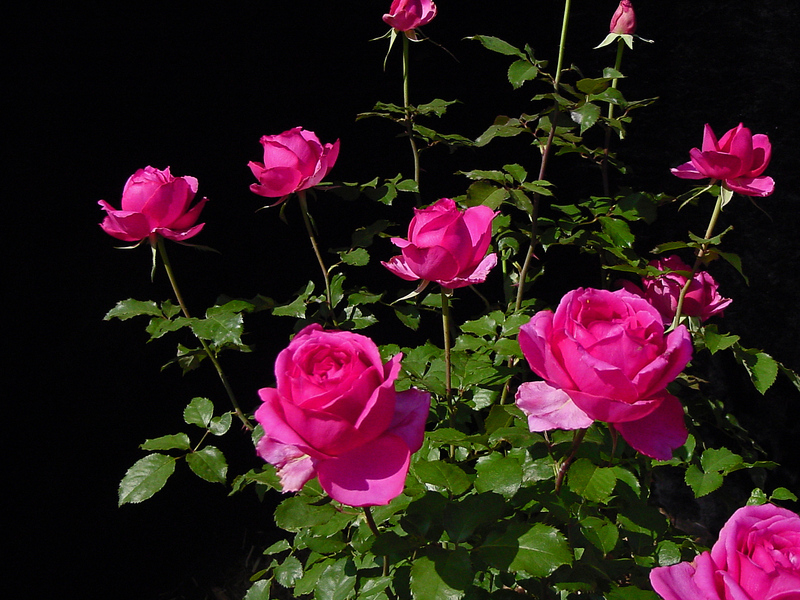 And who indeed has not suffered pangs of jealousy when Mr. Moy's hybrid aromatic and lovely roses bloom profusely at the height of summer and in the dead of winter when everything else has given up the ghost? 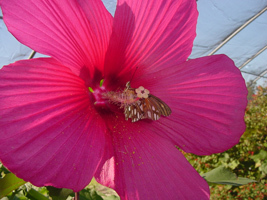 Ying Doon Moy's plants are not only spectacularly beautiful and dramatically eyecatching, they have created a source of income for the San Antonio Botanical Society that made it possible to pay for a $40,000 retail greenhouse on the grounds of the San Antonio Botanical Garden. 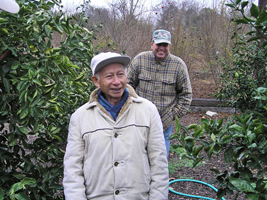 When Harry Mazal and I were volunteers for Mr. Moy in his research garden, we reported to him all the interest in his plants. 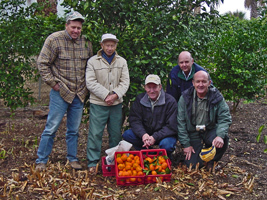 Finally, after talking with the Director of the Garden and the board of the Botanical Society, Harry convinced Mr. Moy that we could create a team of volunteers to grow his papaya and offer it for sale at our springtime garden festival. We planted 1,000 plants and were sold out before the event even ended! 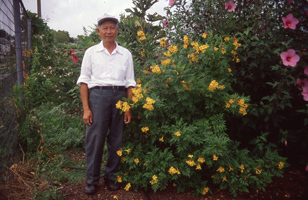 At the end of January, 1999, Ying Doon Moy retired from his position as Research Director at the San Antonio Botanical Garden after 18 years. 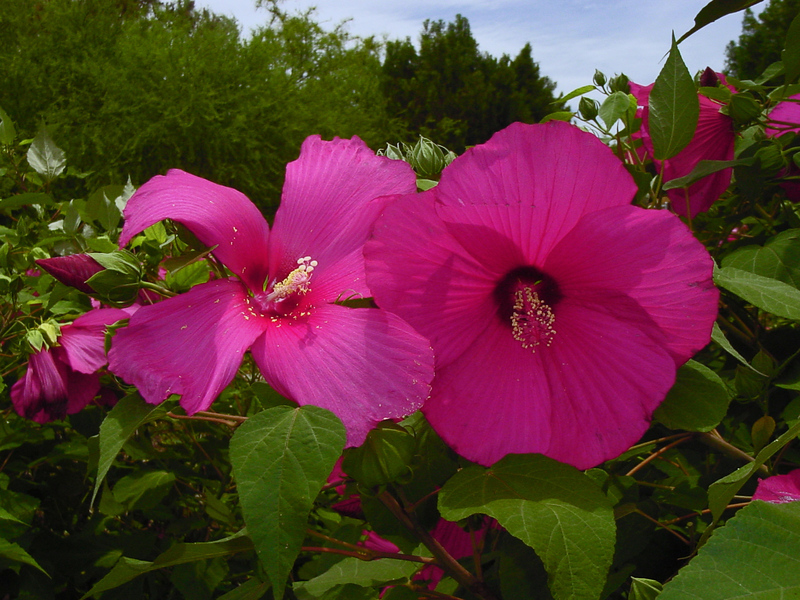 This humble, distinguished research scientist brought great acclaim to the San Antonio Botanical Garden. 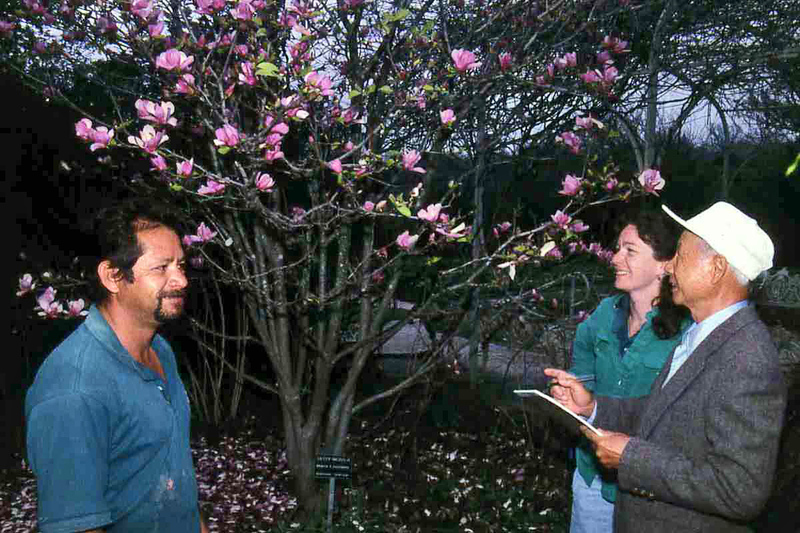 His gifts and high standards of performance enhanced all areas of his work, from his early years as a gardener to his final years as research director. Honors included the Imagineer Award, Mayor's Award, City Star Employee Award, and Honorable Mention Award from the Garden Club of America. 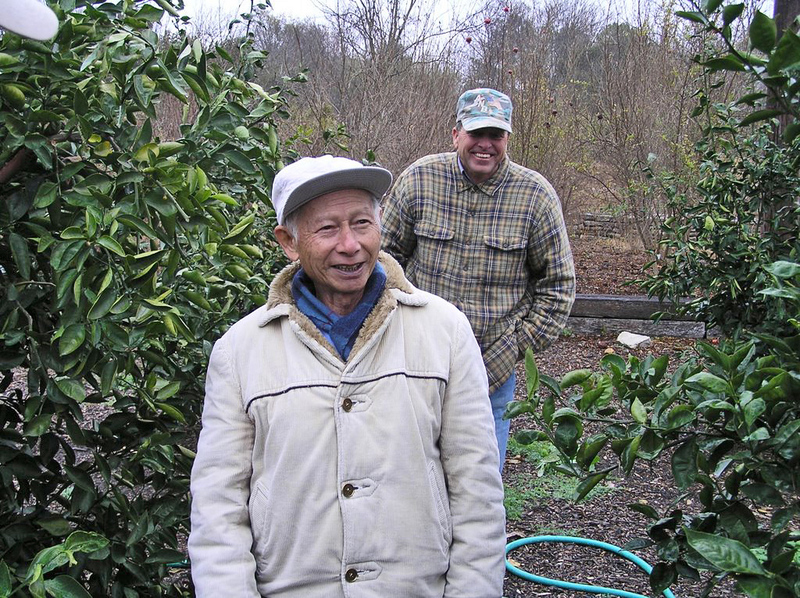 In 2009, Ying Doon Moy, 80, was enlisted by the Mercer Arboretum near Houston to breed vegetation that would thrive in Houston’s extreme climate. 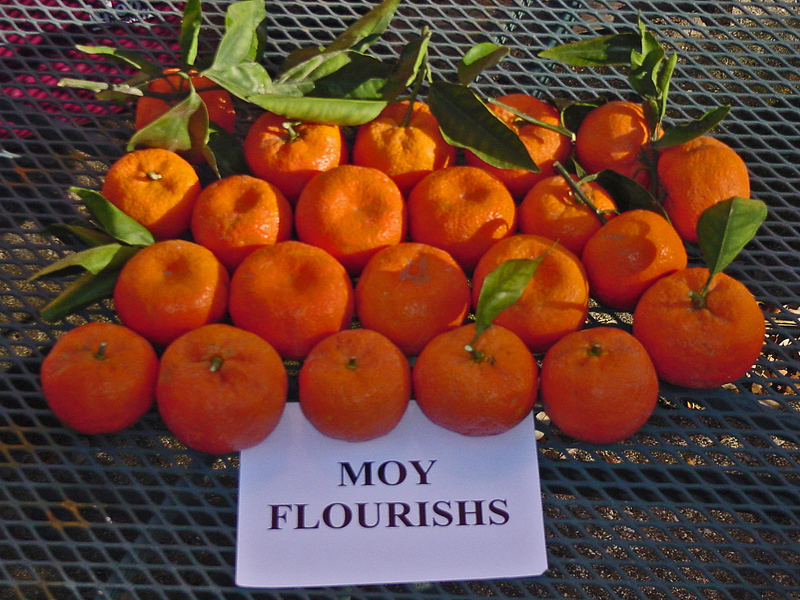 Moy’s title was horticulture research and development director. 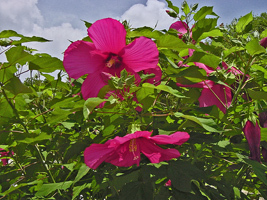 He worked with plants in the Gulf Coast area, where the climate shifts from very hot and dry to very wet, must be adaptive and resilient in order to survive and flourish. Plant types he researched include tropical hibiscus, irises, butterfly gingers and daylilies. 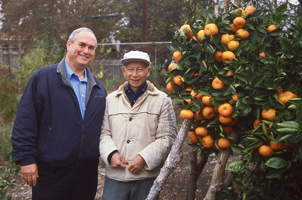 I had the extremely fortunate experience of knowing Mr. Moy while serving as the county horticulturist in San Antonio for the Texas Agricultural Extension Service, as director of research and development at Lone Star Growers, and as a horticulturist with the San Antonio Botanical Gardens. Mr. Moy was an outstanding horticulturist, a great plant breeder and a dedicated teacher. He was always happy and always willing to help and teach me. He was my friend. He wasn’t just my friend however. 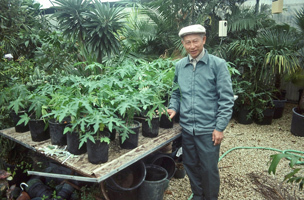 If you were interested in plants and interested in learning, he was your friend too. 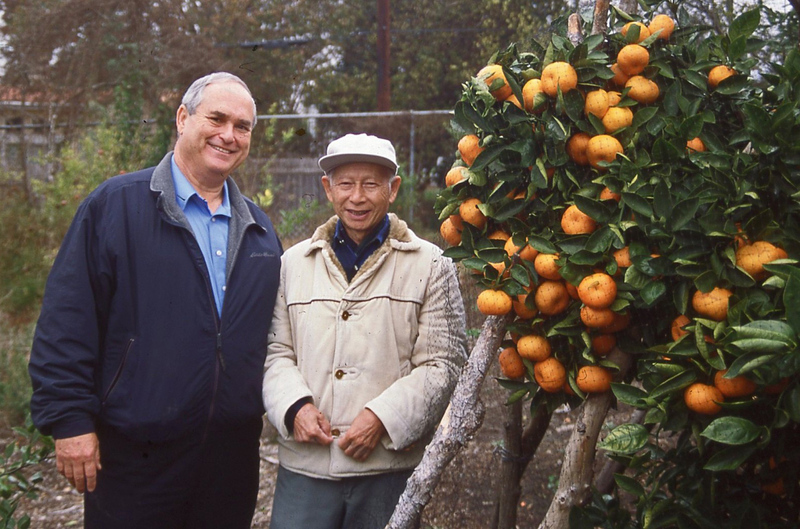 On behalf of the entire horticultural community and his many friends, thank you Mr. Moy for a life well lived and a job well done. Your memory will grow on forever. Please convey my deepest sympathy to his family for their loss, and the joy I had to know and work with him. He was a very giving person, humble and hard working. He always showed me kindness and was always willing to teach what he knew to be true in a very humble way. He was a man with a great soul. 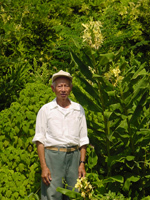 The hybrids he created for the plant world such as Moy Grande Hibiscus and Moy Giant Yellow ginger are his legacy and his memory will live on forever. Mr. Ying. 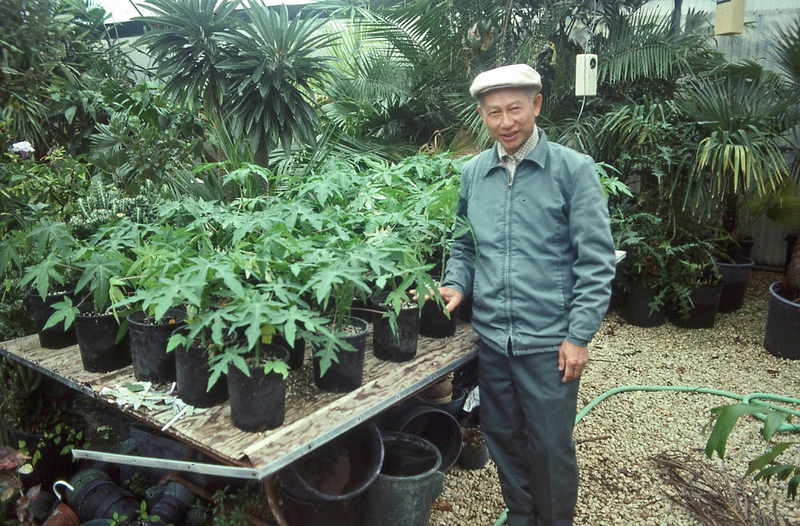 Doon Moy's plant children will keep his legacy strong. 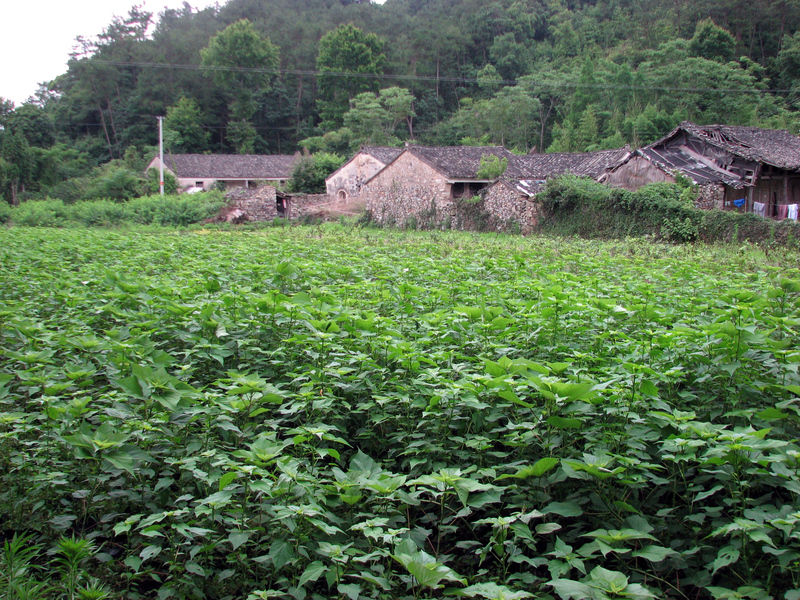 A few years ago I visited a nursery in the mountains near Ninghai, China. It was a beautiful spot. The day was cloudy and cool for the trek - and recent rains had left the forest and field dripping with dew. 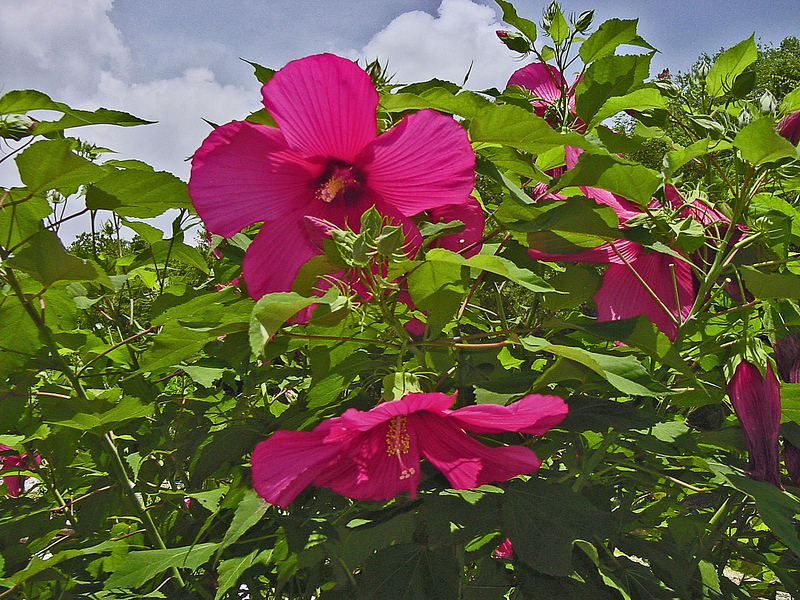 While looking over fields of small trees and shrubs I ran into a large plot of 'Moy Grande' hibiscus in bloom, a huge surprise. The plants looked gorgeous. 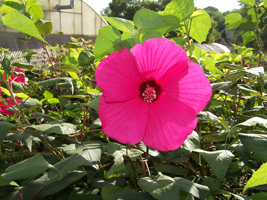 I soon learned that the big flower had become popular in areas near the coast. 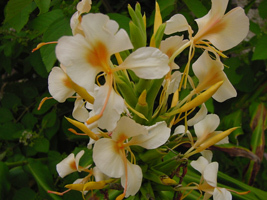 . . not just for the flower, but because the plant had "good tolerance" to salt. Mr. Moy's cross made it happen. 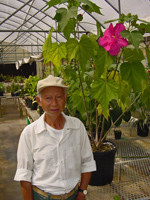 Moy's calm and patient relationship with plants was inclusive not exclusive - and his breeding work with tropical hibiscus, irises, butterfly gingers, daylilies, papayas, roses, and citrus has left a trail of interesting plants that has benefitted the world we live in. 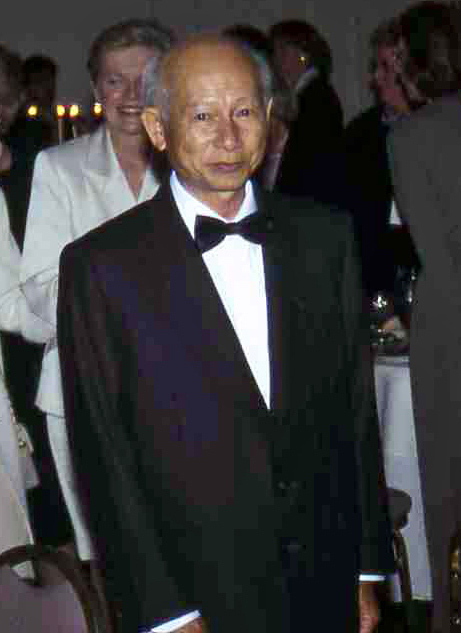 We appreciate more and more as time goes by, the true genius of Mr. Moy. 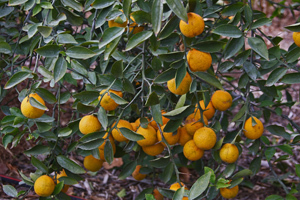 Trifoliate orange is the most cold hardy citrus though its fruit are for the most part non-edible ( Nagle, 1997). Numerous crossed have been made with trifoliate orange to capitalize on this cold hardiness, however for the most part the fruit quality remains poor (Nagle, 1997). 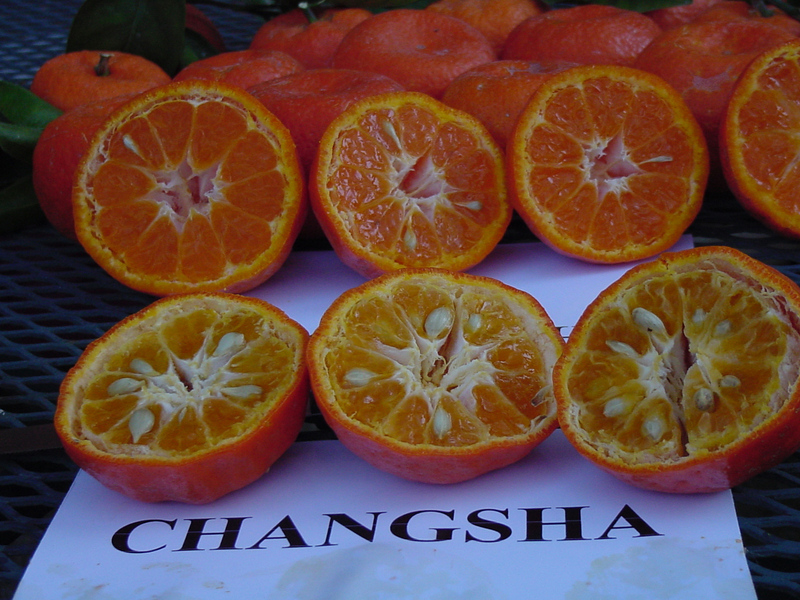 ‘Changsha’ tangerine which originated in the foothills of China also has exceptional cold tolerance, but has fair fruit quality having numerous seeds per locule (Sauls, 1981) ‘Changsha’ appears to a hybrid which includes Ichang Papeda (Nagle, 1997). 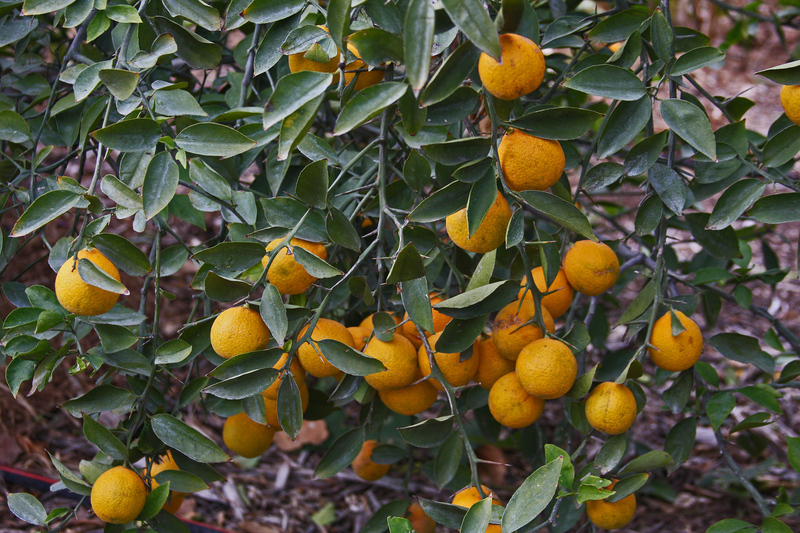 Ichang Paapeda is probably the cold hardiest of the evergreen species of citrus and it is native to the warm temperate inland areas of China (Nagle, 1997). Crosses between ‘Changsha’ and Satsuma could increase cold tolerance and maintain fruit quality. Such a cross resulted from a controlled breeding program in San Antonio, TX, U.S.A. 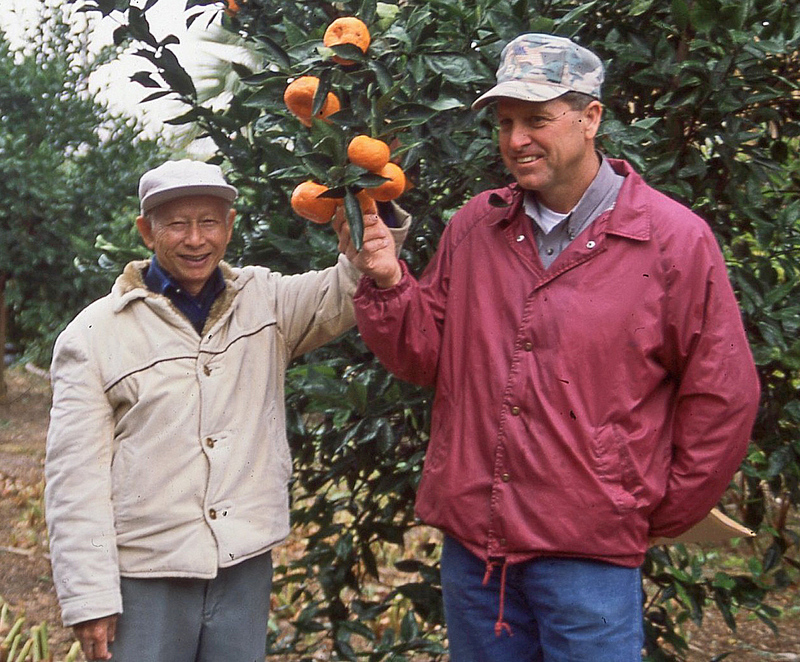 The overall purpose of the breeding program was the creation of Satsuma and tangerine hybrids that exhibit the cold tolerance of the tangerine, but maintain the Satsuma fruit quality. 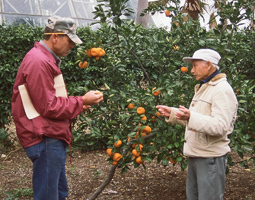 After he retired from the San Antonio Botanical Garden in 1999, Mr. Moy returned as a part-time employee in 2004 to evaluate his new hardy Satsuma-Changsha seedling crosses (called Changsats). Mr. Moy had genetically crossed the ‘Changsha’ tangerine with a Mandarin Orange (Satsuma) to produce a high quality fruit which is mostly seedless and more cold hardy than Satsumas. This was no small feat and has never been accomplished by any other plant breeder in the world. 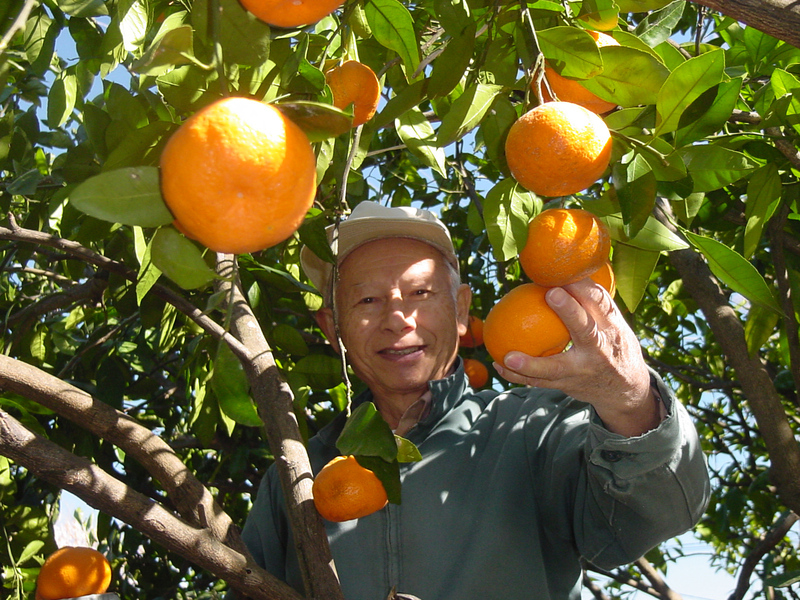 His hardy Satsuma-Changsha seedling crosses will provide delicious fruit to people who have never been able to reliably grow citrus in their area. The first release named ‘Orange Frost’ (Mr. Moy named it ‘Flourishing’) and his high-yielding, precocious variety he named ‘Bumper’ will be available all over Texas in 2013 and are already being sold in San Antonio in 2011. These selections will be designated Texas SuperStars by Texas A&M. 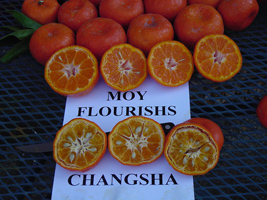 ‘Orange Frost’ (‘Flourishing’) was selected by Ying Doon Moy in 2005 as a single unique tree that resulted from an embryo rescue of a seed obtained from a cross made by Moy in 1998 between the tangerine Citrus reticulate ‘Changsha’ , and an unnamed seedling of a mandarin Citrus reticulate var. unshui (syn, Citrus unshui) as the male parent. 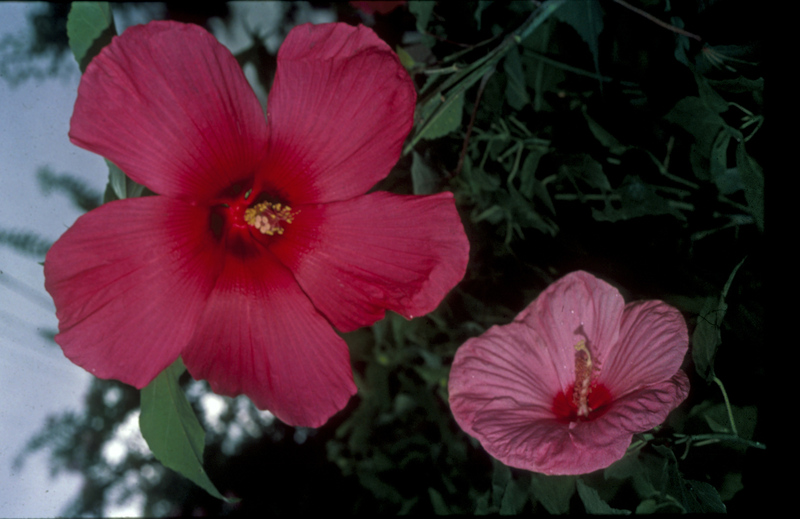 Asexual propagation of the new cultivar was first accomplished by stem cuttings in San Antonio, TX in 2005 by Larry Stein and Jerry Parsons. 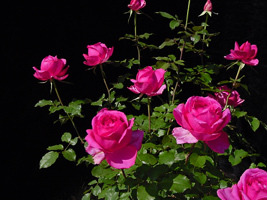 It has been determined that the characteristics of this cultivar are stable and reproduced true to type in successive generations.